Top South African trail runner, Megan Mackenzie, set out with high intentions for a top 10 finish at Sunday’s third Golden Trail Series race. Top South African trail runner, Megan Mackenzie, set out with high intentions for a top 10 finish at Sunday’s third Golden Trail Series race, Sierre-Zinal in Switzerland, but things didn’t unfold as planned. Crippled by stomach cramps and unable to eat or drink for most of the race, Mackenzie fought through to the end, accepting her 23rd place finish as a learning experience that will put her in better stead for her next race. Sierre-Zinal, the third race in the inaugural Golden Trail Series, has been the shortest distance to date, but the fastest course. With around 2200m of vertical ascent and 1000m of descent in the 31km, the route is considered “flat” by most elites, which translates to “fast”. Mackenzie knew she had to run a strategic race to secure a top ten finish, but stomach issues thwarted her attempts and she finished 23rd. Sierre-Zinal, also dubbed Five 4000s Race because the route boasts a spectacular vantage point of five peaks over 4000m, played host to the fastest, fiercest competition to date on the Golden Trail Series. The women’s win went to Kenyan, Lucy Murigi, repeating her unrivalled performance from last year and breaking the three-hour barrier finishing in a time of 2:57:54. Second place went to German, Michelle Maier, and third to Swiss local, Simone Traxler. Ruth Croft ran an incredible race and finished fourth, just 30 seconds behind third place. Her fourth-place finish moved her to the top of the overall Golden Series Leaderboard. Another Golden Series favourite, Ida Nilsson, found herself in a sprint finish after the fast, 31km route, and finished eighth, a fraction ahead of Laura Orgue. In the men’s race, the Spaniard, Killian Jornet’s, downhill running was another master-class over the final stretch and he won going away in 2:31:39, besting Scot, Robbie Simpson, by 1:31, as he did a year ago. Kenya’s Robert Surum was third in 2:33:18. Mackenzie now travels back to South Africa to sort out some visa admin, before returning to Scotland in September to race the fifth race in the Golden Trail Series, the Ring of Steall. She will miss the fourth race in the series, Pike’s Peak, but athletes are only expected to run three of the five events so it won’t affect her standings. 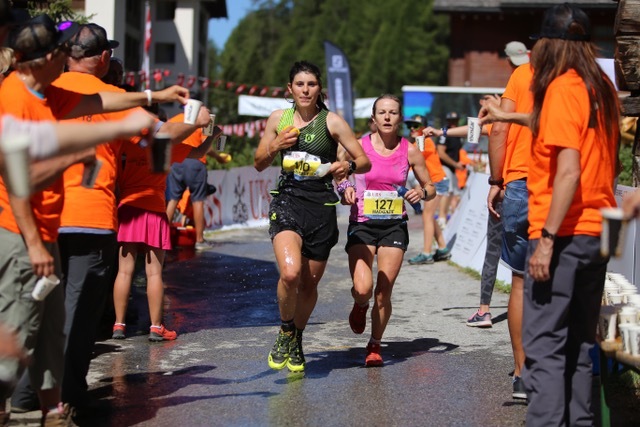 Her 23rd place finish combined with Sierre-Zinal’s top 10 women have put her eighth on the overall Golden Trail Series leaderboard, and incredible achievement for our local trail star. The Golden Trail Series combines five of the most iconic “short-distance” trail races on the planet into a dream tour for both athletes and fans. A €100,000 (R1 478 305) prize pool will be shared equally among the overall top 10 men & women at a Grand Final at the Otter Trail in South Africa in October. Each of the top 10 will travel with a friend or partner of their choice for the trip of a lifetime to compete for their chosen cause or charity.